Breast Cancer Cure and Wilson Parking teamed up in October for Breast Cancer Month to trial a New Zealand first in fundraising. 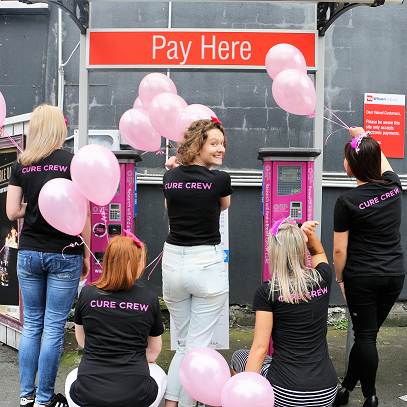 In an idea developed by New Zealand’s leading media agency FCB Media, for each pink ticket issued at one of five participating Wilson Parking sites across New Zealand, $1 will be donated to Breast Cancer Cure to support their efforts in finding a cure for breast cancer. A total of $13,000 was raised! Wilson Parking CEO Stephan Wuffli says, “Wilson Parking is proud to be involved in this parking industry first, helping support funding research of a disease affecting so many New Zealanders and their families. RevitaLash went PINK for Breast Cancer Awareness Month! $1 from every RevitaLash 3.5ml and RevitaBrow 3.0ml sold in October was donated to Breast Cancer Cure New Zealand. RevitaLash was developed by Dr Michael Brinkenhoff as a gift for his wife Gayle, while she was recovering from breast cancer treatments. Chemotherapy had damaged Gales beautiful eyelashes leaving them weak and thin. Dr Brinkenhoff believed he could develop a formula that would give Gayle’s lashes the look of renewed health and strength and revitalize the natural beauty of all women. A huge thank you to Revitalash for raising $834! This October Intimo lingerie donated an amazing $1,295 to Breast Cancer Cure in New Zealand to aid much-needed research into the prevention and cure of breast cancer. Intimo’s Check, Share #BEBREASTAWARE campaign encourages women to examine their breasts regularly, and advise their friends and family to do the same. #BEBREASTAWARE impresses upon women the importance of breast health and awareness, so that should a change occur, they have the knowledge to act accordingly. Each and every Intimo bra comes with a step-by-step guide on how to conduct your own self-checks. Similarly, our Fit Specialists feel it their duty to conduct conversations around breast cancer and its prevention at every fitting they attend. Stick them to the bathroom mirror as a constant reminder to make breast health and body awareness a priority. As part of Breast Cancer month, we wish to thank I AM Company for their support during the month of October in fundraising activities to help fund more research into finding a cure for breast cancer. The Delight Box raised a fantastic $950 for Breast Cancer Cure. With Christmas just around the corner, make sure that you visit our Cure Shop for gift ideas. We have a fabulous range of items for sale that are perfect as a stocking filler or for those hard to buy loved ones. Our Cure Shop items include Scented Candles, Trelise Cooper designed Tea Towels, Drink Bottles, Ema Frost designed coffee cups and note books. PLUS we have packs of Christmas Cards for sale too with 100% of the proceeds going to breast cancer research. Breast Cancer Cure is New Zealand's only not-for-profit organisation established solely to support research into breast cancer. Funds raised are allocated to only the most outstanding and visionary research and researchers in New Zealand.